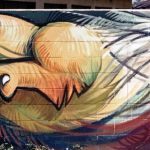 Finding Los Angeles: Barbara Carrasco’s L.A. History: A Mexican Perspective – ¡Murales Rebeldes! 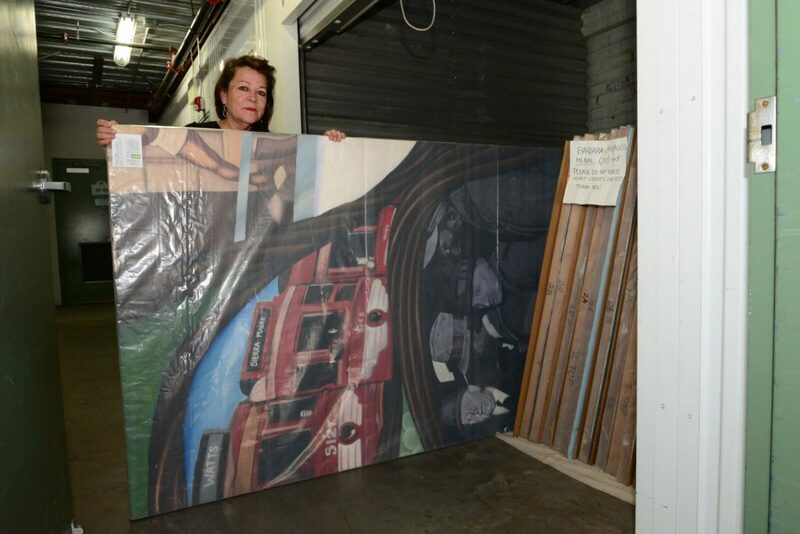 Barbara Carrasco with panels of L.A. History: A Mexican Perspective in a storage unit, 2017. Courtesy California Historical Society/LA Plaza de Cultura y Artes; photo: Oscar R. Castillo. 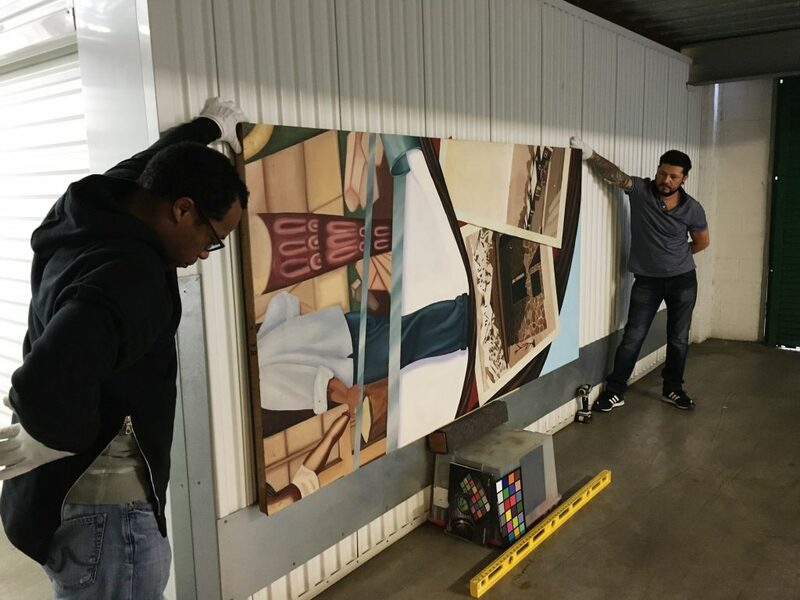 Forty-three mural panels are languishing in a Pasadena storage facility, some ten miles and thirty-five years away from the mural’s intended location in downtown Los Angeles. Their creator, Barbara Carrasco, stores them there for safekeeping. Unfortunately, this is not surprising, given that the mural—designed to tell the city’s history with an emphasis on the perspective of communities of color—was censored even before its completion in 1981. Or that it has not been shown in public in its entirety since 1990, when it was temporarily exhibited at Union Station during the Los Angeles Festival. 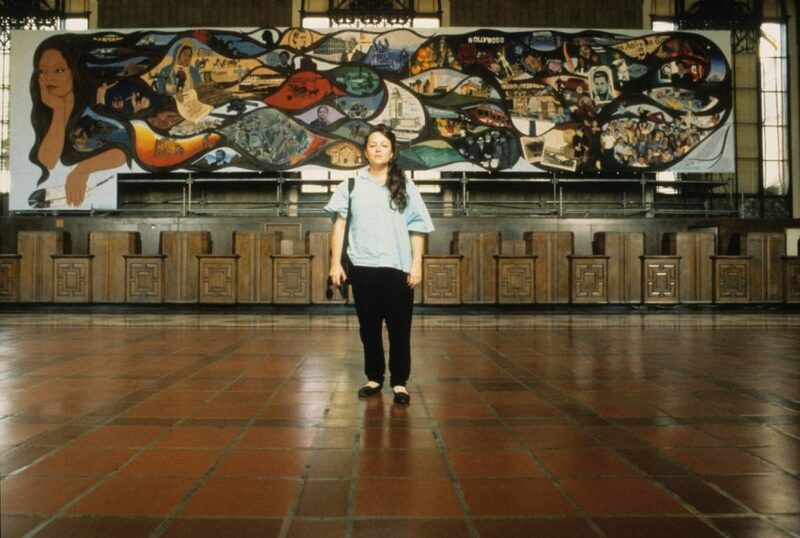 Barbara Carrasco and L.A. History: A Mexican Perspective at Union Station, 1990. Courtesy Barbara Carrasco; photo: Harry Gamboa, Jr. But after more than twenty-five years since its completion, an opportunity arose to uncover the mural. In February 2016, a small group gathered at the storage unit. 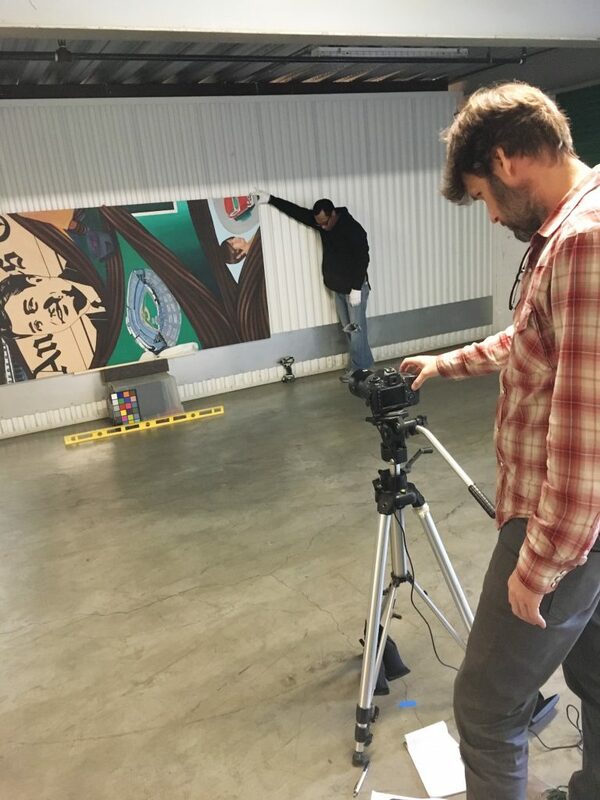 They had come to unwrap the panels and photograph them for inclusion in the exhibition and publication ¡Murales Rebeldes! 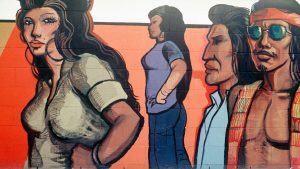 L.A. Chicana/o Murals under Siege—a project undertaken for the Getty’s Pacific Standard Time: LA/LA initiative. 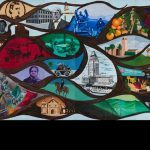 Presented by the California Historical Society and LA Plaza de Cultura y Artes, the exhibition opens on September 23, 2017 at LA Plaza, 501 North Main Street, Los Angeles—just across from the historic El Pueblo National Historic Monument and Olvera Street. 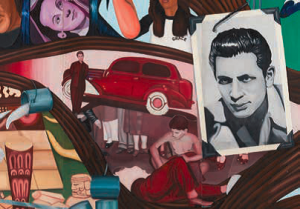 The mural, L.A. History: A Mexican Perspective, is one of eight Chicana/o murals featured. Panels of L.A. History from storage unit prepared for photography, February 2017. Courtesy LA Plaza de Cultura y Artes: photo: Javier Guillen. The mural tells L.A.’s history from a feminist and Chicana/o perspective. Fifty-one historic scenes unfold chronologically, woven into the strands of a woman’s hair. L.A. History is comprehensive and well researched, but the agency that had commissioned it for display during the city’s 1981 bicentennial celebration objected to fourteen of its scenes and tried to censor the mural. Carrasco fought back. 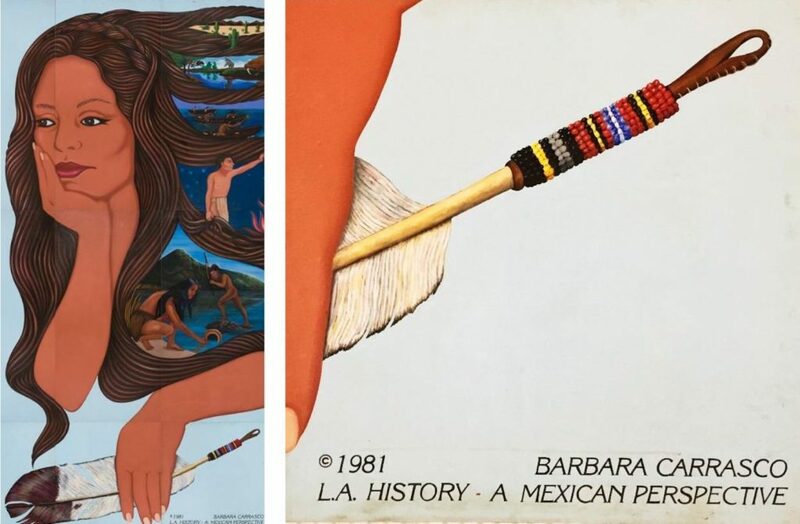 Although she won legal action over ownership of her work, L.A. History was never shown in its intended location during the bicentennial or, as the artist also had hoped, a few years later during the 1984 Olympic Games in Los Angeles. Details of L.A. History show its feminist perspective (left) and copyright symbol (right), 2017. Courtesy California Historical Society/LA Plaza de Cultura y Artes; photos: Sean Meredith (left), Javier Guillen (right). The mural’s panels have been moved many times during their thirty-five-year history. Carrasco began painting L.A. History in her studio at an old United Artists building. When the studio became too small, she moved the panels to a vacant floor at City Hall’s east building. Upon completion, forty 4 x 8 feet panels illustrating fifty-one scenes of Los Angeles’s history would be assembled to compose a 16–20 x 80-foot mural. Barbara Carrasco, L.A. History: A Mexican Perspective (1981), 2017. Courtesy California Historical Society/LA Plaza de Cultura y Artes; photo: Sean Meredith. 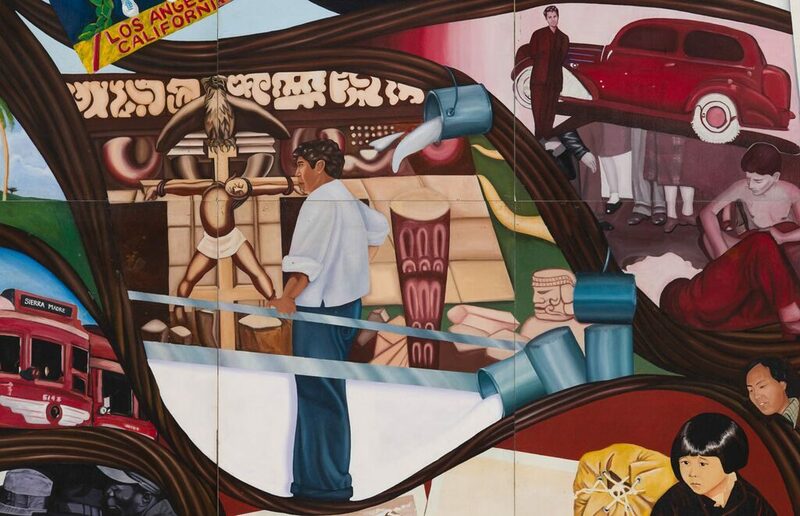 Because of the controversy over the mural’s censorship, Carrasco moved the panels again, despite their size and number, first to the Community Service Organization (CSO) in East Los Angeles and then to the United Farm Workers headquarters in Keene, California. Later, she assembled sections of the mural for exhibitions. L.A. History was partially displayed at the Massachusetts Institute of Technology List Visual Arts Center’s in L.A. Hot and Cool: The Eighties (1987); at the Otis Art Institute of Parsons School of Design Otis College of Art and Design in Agit Pop (1988); and at the Autry National Center of the American West, outside the exhibition Siqueiros in Los Angeles: Censorship Defied (2010). But on that day in February 2016, the panels emerged from storage not to be relocated but to become part of the mural’s historic documentation. As they were unwrapped, to be photographed at the storage facility, Los Angeles’s history was unveiled, along with the objectionable scenes that had led to the mural’s censorship. 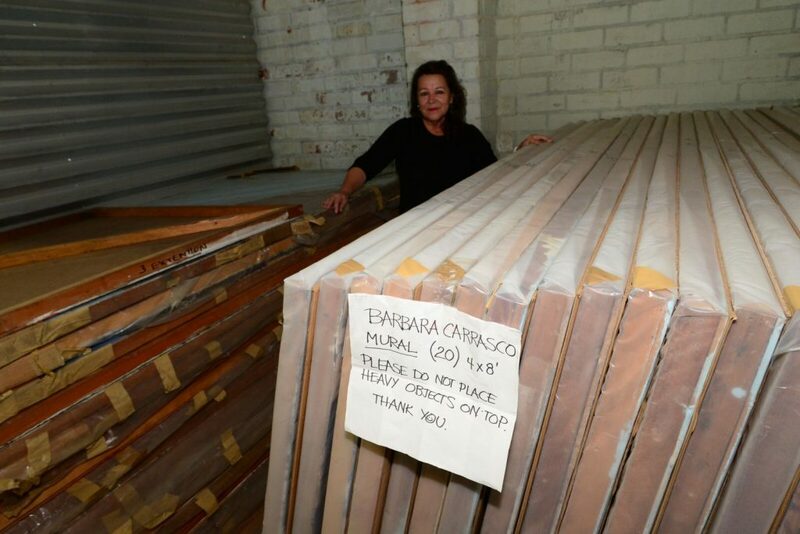 Barbara Carrasco with L.A. History in storage, 2017. Courtesy California Historical Society/LA Plaza de Cultura y Artes; photo: Oscar R. Castillo. Panels from storage unit prepared for photography, February 2017. Courtesy LA Plaza de Cultura y Artes: photo: Javier Guillen. These included depictions of Native American cultures; famous former slave turned entrepreneur and philanthropist Biddy Mason; the site of the 1871 lynching of Chinese miners; the World War II-era relocation and incarceration of people of Japanese descent; Ruben Salazar, a Los Angeles Times reporter who died during the August 29, 1970 Chicano Moratorium march; urban redevelopment projects such as Dodger Stadium and Bunker Hill; the whitewashing of David Alfaro Siqueiros’s mural América Tropical; and the Zoot Suit Riots. 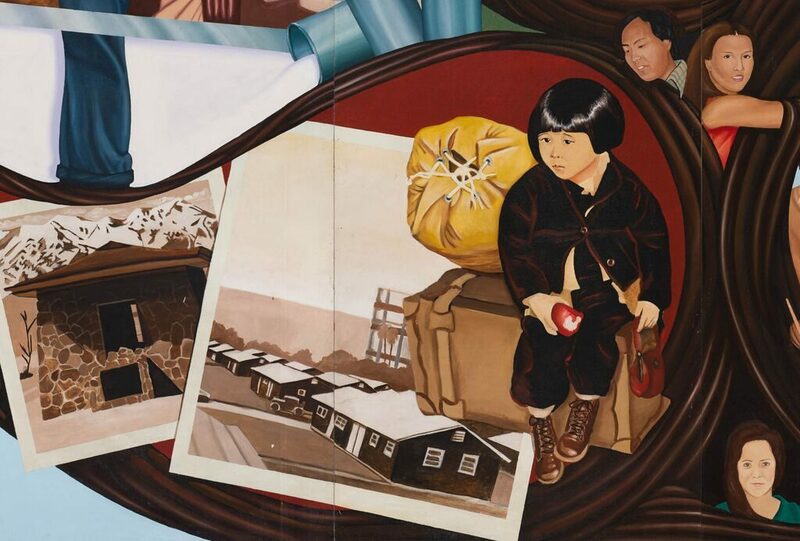 Mural detail, Japanese relocation and incarceration during World War II, Barbara Carrasco, L.A. History: A Mexican Perspective (1981), 2017. Courtesy California Historical Society/LA Plaza de Cultura y Artes; photo: Sean Meredith. 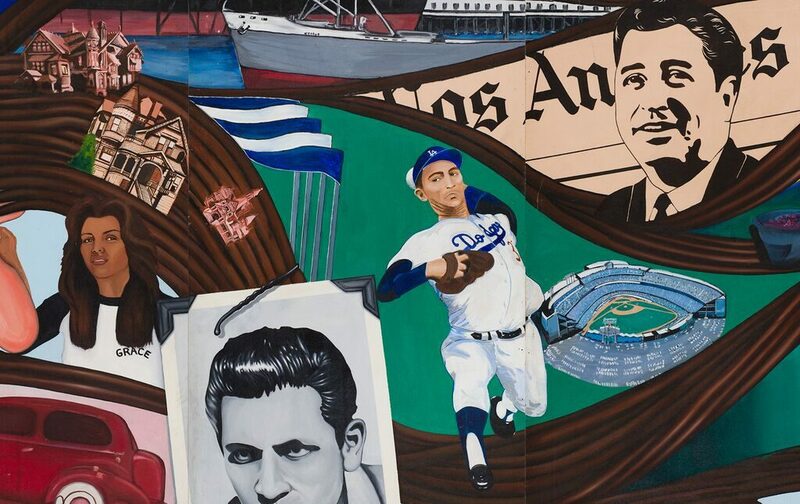 Mural detail, Ruben Salazar (top right), Dodger Stadium (center right), Bunker Hill (top left), Barbara Carrasco, L.A. History: A Mexican Perspective (1981), 2017. Courtesy California Historical Society/LA Plaza de Cultura y Artes; photo: Sean Meredith. 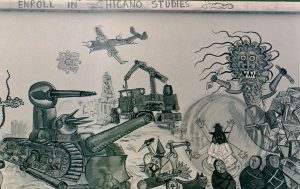 Mural detail, Whitewashing of David Alfaro Siqueiros’s América Tropical, Barbara Carrasco, L.A. History: A Mexican Perspective (1981), 2017. Courtesy California Historical Society/LA Plaza de Cultura y Artes; photo: Sean Meredith. Los Angeles may have an opportunity once again to confront competing visions and representations of its history in 2028, when the city once more hosts the Olympics Games. This writer can only hope that such distinctions are in our past and that multiple perspectives about the city’s past, present, and future will be proudly displayed.